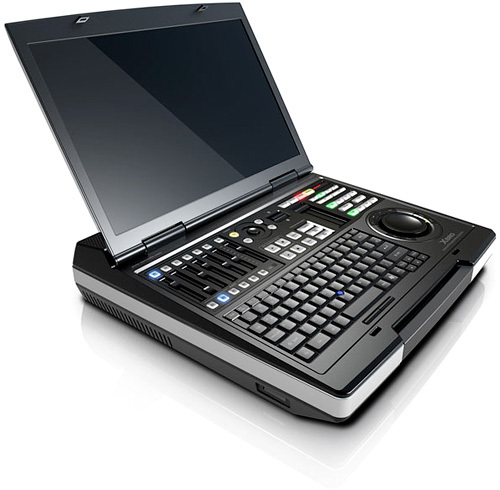 UCCTOP XENO Laptop For Internet Broadcasters | OhGizmo! While thin and highly compact laptops have become very popular these days, the UCCTOP XENO is bucking that trend by being a monstrous, briefcase sized system. But what it lacks in portability it more than makes up for in terms of functionality, particularly if you’re in the business of streaming broadcasts to the web. While editors will love the built in jog/shuttle wheel, the UCCTOP XENO seems more tailored for running live productions since it has a built-in 4 channel video switcher and a 6 channel audio mixer with actual faders. It’s also capable of inserting subtitles and corporate logos during live broadcasts, and can be used to remotely control video cameras or other playback devices like VTRs and DVD players. And even with a price tag of around $10,000, it’s probably still cheaper than buying a standalone video switcher and audio mixer. It seems weird to see an off-center keyboard but I guess it’s necessary with the other controls on this laptop.